Home › News › PCGen 6.07.08 Released! PCGen is pleased to announce the release of PCGen 6.07.08 (Alpha). The Formula change over is steadily progressing, with this release FACE and BaseSize has been converted in the Starfinder gamemode. PCGen is a RPG character generator and maintenance program (d20 systems). All datafiles are ASCII so they can be modified by users for their own campaigns. Please join us http://groups.yahoo.com/group/pcgen/ or visit our forums http://pcgen.org. 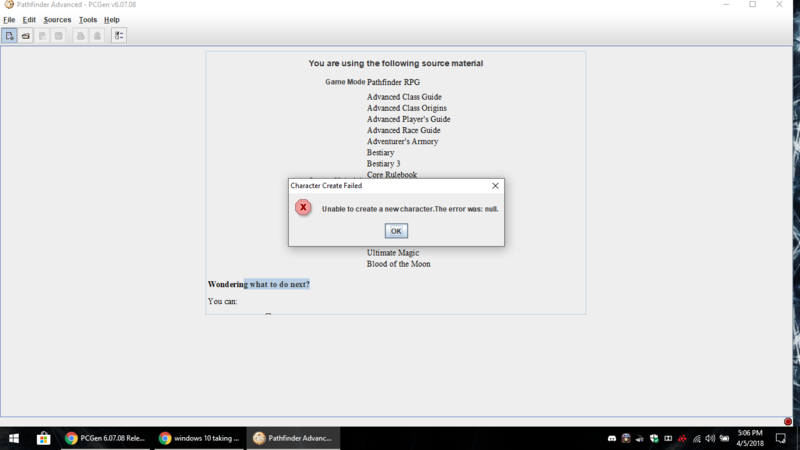 I managed to fix this by removing Ultimate Campaign and Ultimate Intrigue from my source list when using the Pathfinder RPG Core Supplements (as well as manually removing the sources for each individual characters via Notepad++). I noticed with making a Starfinder character that Athletics isn’t being calculated correctly. I’m playing a Vesk Solarian with Vesk Overplate, Str of 14, and 6 ranks in Athletics. So that should be 6 ranks, +2 from Str, 3 from trained skill, and then a -1 from the heavy armor(which was a -2 before the racial reduction of 1) So the total should be a 10, but it is calculating it at an 11. Also, is there a way to edit the character sheet itself to change something like this? I’d also like to edit the damage on the unarmed strike for my Vesk since theirs isn’t considered to be Archaic and it gets additional damage added to it. when will pact worlds be added? level 6 fighter/vinking bug, don’t allown the viking bonus feat selection. is there going to be an update for more of the 5E books? Like Volo’s Guide and ones like that? Since doing so would run the risk of getting sued over it, I highly doubt they will be doing that. If you google it, though, you will find third parties who have provided more complete 5E data files. Will there be an update for Pathfinder 2nd edition Playtest and will you be adding Starfinder? Can someone verify that the skills for an Operative are given their free ranks in their specialization associated skills? “Your specialization grants you the Skill Focus feat (see page 161) in your specializations associated skills, and you gain a free rank skill in each of those skills at each operative level” [Core Rulebook pg 93.] I was manually transferring my printed sheet to a handwritten form and was verifying ranks in levels and my 5th level operative seems to be short 2 skills ranks per level. I am making a character. I chose 3 traits that gave +2 initiative each. The character sheet only shows my dex and +2 other. I removed all of the traits and it still says +2 other so Im not sure where it came from. But my main complaint was not being able to see all 3 traits raise it to +6. I use this all the time, while not an expert or on the team I might be able to help. 2) Did you add the 3rd by taking a Drawback or add it in as a bonus?